As often as possible, I try to pull fabric for an entire quilt from my stash, and make it without purchasing any extra fabric. The discipline in this practice was born of necessity a few years ago, as quitting my teaching career to be a full-time quilter and pattern designer meant that finances immediately got a little tighter. That being said, I have really grown to love the challenge of stretching my stash. 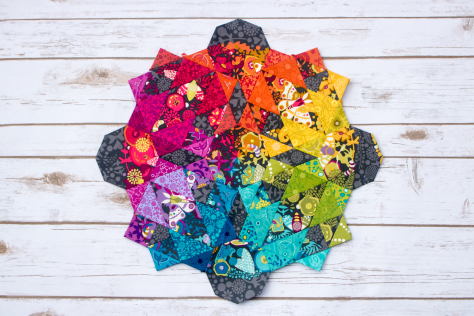 As I'm sure you've guessed, this bright and happy quilt is entirely from my cabinet, including the Kona Ash background, which I scored as three separate remnants (major luck)! I'm really not a pink person, so I don't use it very often, but it can be sweet every now and then. 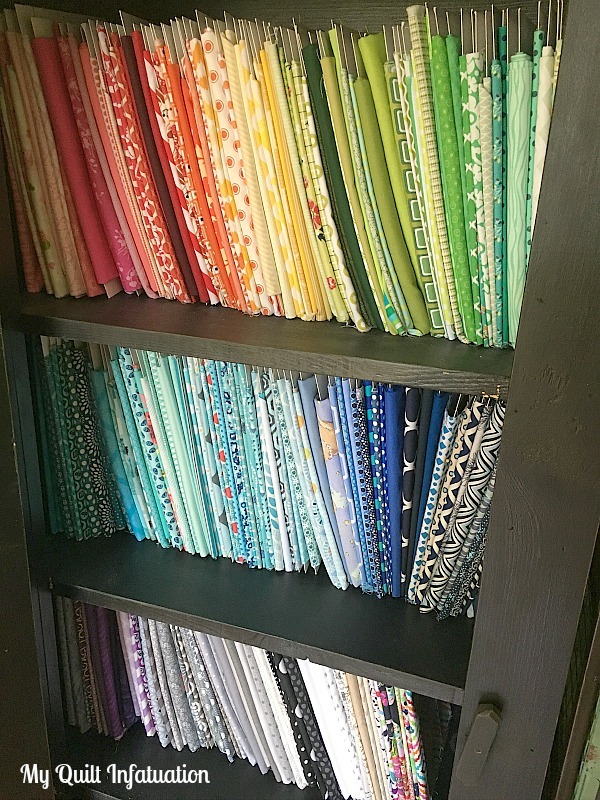 You know, many people are surprised when they see my fabric stash, thinking that surely a full-time quilter has mountains and mountains of fabric. Though I try to keep a decent variety of colors, my stash is very modest in comparison to many, and I like it that way. Because the fabrics in my cabinet turn over pretty quickly, I hardly ever come across a print that I've had for so long that I no longer care for it. Shopping my stash becomes more difficult as the selection dwindles, but that's part of the fun of the challenge! Don't get me wrong, of course I love buying fabric too, but when I feel like I've sewn an entire quilt from "free" fabric, I really feel like I've accomplished something. What about you? Do you like to keep a huge stash and shop from it exclusively? Do you prefer to purchase fabrics specific for every single quilt, or do you use a combination of approaches when you're starting a new quilt? Okay y'all! Let's check out last week's party highlights. This beauty by Savor Every Stitch is just fabulous, and my oh my, just look at that quilting! ps- There are more close-ups on her post! Take a look at this awesomely round mini by Kittens and Threads. I can't resist a rainbow, friends! I love this Postcard From Sweden quilt by Anja Quilts. Michelle at From Bolt to Beauty linked up this pretty reminder that we are on the downhill slide of another year, and Christmas will be here before we know it! 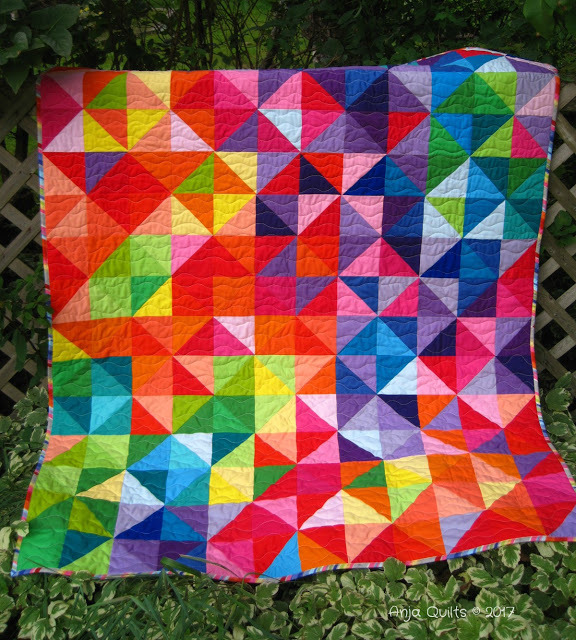 and finally, Kitty at Night Quilter shared this colorful bit of EPP awesomeness. Yes, you counted correctly. I did actually link up six features this week, rather than the usual three. Double the features = double the fun! I simply could not help myself. There were just too many fantastic projects, and I couldn't narrow it down any further. I'm super excited to see the fantastic projects that you bring this week! Party on! Great quilt top! I'm envious of your willpower to maintain a very reasonable stash. I'm weak, my stash is huge and I'm aware of the fact that I'll probably never use all the fabric. Do I let that stop me from buying more, oh heck no! My latest addition was the entire line of Tula Pink's new Spirit Animal...I couldn't resist! Ooo, what a lovely stash you have! I feel so satisfied when I've been able to use from my own, your quilt is beautiful. Also I love that sewing machine mini, so sweet, and the quilting on Savor Every Stitch's quilt, Wow!!! P.S. 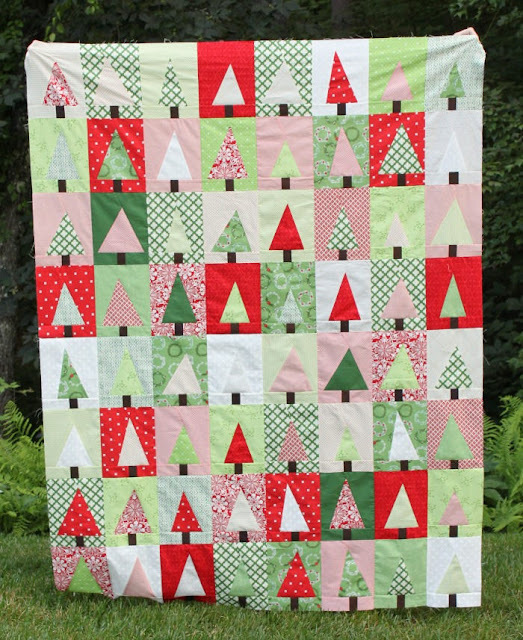 Thanks for the shout-out about my Christmas quilt! Wow! Your stash is exceptional! And double the links was really fun! You have a beautiful stash! I don't think my stash is too much, but I'll admit I have fabric from years ago that has yet to be used. Prints! Mostly I use what I have on hand. Every once in a while I splurge...it can be tempting when we see beautiful stacks of fabric. 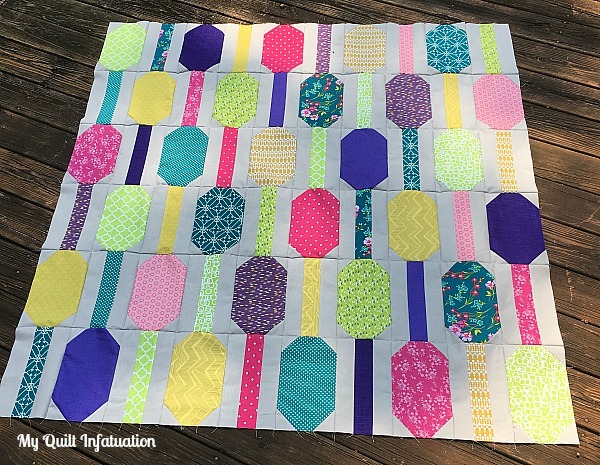 Kelly, such a cheerful quilt! This would be a fun one for playing with various motifs in the color portions, with perhaps a unifying filler in the background. My great-grands would have fun playing "find the matching blocks" and driving toys along the "streets." I love to quilt from my stash, and, often find the inspiration for a quilt design when I stroll through the bins and just look at what's there. I rarely buy fabric for a specific quilt. Most of my purchases are when I see a fabric that just MUST come home with me, although not as often since retirement as before. After I wash and press the fabric I hang it in my fiber studio (aka sewing room) and let it speak to me. If there are no sparks in a month or so it goes to the appropriate bin (by color by type) until my next stash dive. I doubt I will ever use all my fabric but will be happy to pay forward to other quilters some day, much as I have benefitted from remaining stash when quilter friends have passed. Meanwhile, such fun! Thanks for sharing your thoughts and for the double-the-pleasure twice-as-many links. Your stash looks so pretty... and organized! My stash is out of control. I made a ton of impulse purchases when I first started and several of them included prints I would never buy or use now. I keep saying I'm going to destash, but never seem to get around to it. Seeing that pic of your beautiful, well-organized stash might be just what I needed to get my own stash under control. And I love your quilt top; so bright and cheery - just the right amount of pink! These are comic book boards. They are sold in bulk packs (I think mine were in a pack of 200), and they are very inexpensive. They are a thick poster board type, and they measure about 10" tall, by about 7 inches wide. They definitely make it easier to see the fabrics in my stash so they don't get lost. Where would I purchase them - stationery, hardware, other type store? I purchased my from Amazon. but you can probably find them in a comic book store. Ps: How do I know if I'm a "no-reply" blogger? yes, you are a no-reply blogger. Check out this link for steps to help you fix that! Very bright and fun. I try very hard to shop my stash for any new projects. Mystery quilt alongs are usually always from stash. Projects that are going to be gifts are usually a mix, feature prints purchased, but I shop the stash for background and accent fabrics. That's a fun quilt, and so great that it's all from your cabinet. It makes sense to keep your stash on the small side like you said. Sometimes I wonder what I was thinking when I pull something out and look at it. Great show and tell, too. Thanks! That is a beautiful top! I think of lanterns when I see it for some reason. 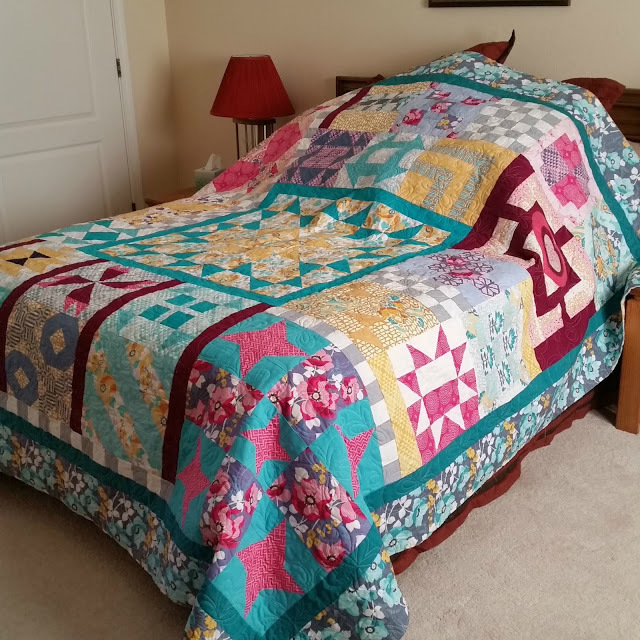 Thank you for featuring my quilt, that was a surprise to me! You must have so much self-control to maintain a small stash! My stash is growing alarmingly out of control. 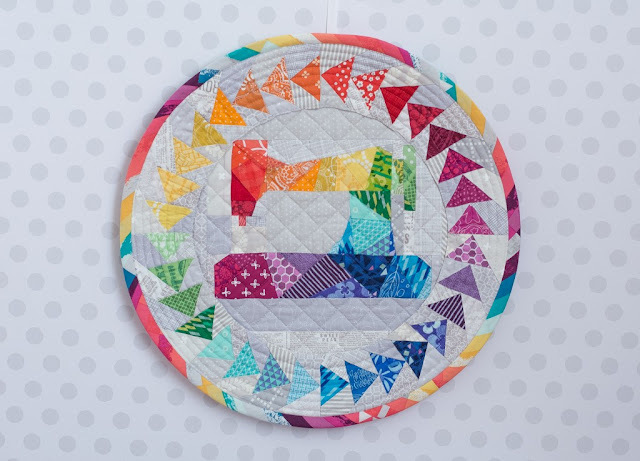 I'm just getting caught up with my blog reading - thanks for highlighting my sampler quilt!